Ice cream come in many forms and can be produced in many different ways, and with different ingredients. Ice cream aficionados will have endless opportunities to ponder the respective qualities and characteristics of various types. Basically speaking, however, ice cream tends to be composed of sugar, fat and water (usually combined in dairy products like milk and cream), with differing amounts of air infused in the frozen final product. Making ice cream is thus ultimately a matter of combining these basic elements in an appropriate and balanced manner, and to make sure that the resulting base mix is frozen as quickly as possible. Those interested in the fascinating food science aspects of ice cream-making can go here. The extended family of frozen desserts is vast. Broadly speaking, however, most tend to fall within the main categories “ice creams” and “sorbets” which we will focus on here. You will also find links to versatile base recipes for ice cream here. To honour the early origins of ice cream-making, we will also take a closer look at granitas and their icy likes, such as the eternally popular ice popsicles. Sorbets are typically made of simple syrup and flavouring, whereas ice creams normally are based on dairy products and sugar. While hybrid categories exist, the focus here will be on granitas, sorbets and (dairy-based) ice cream. 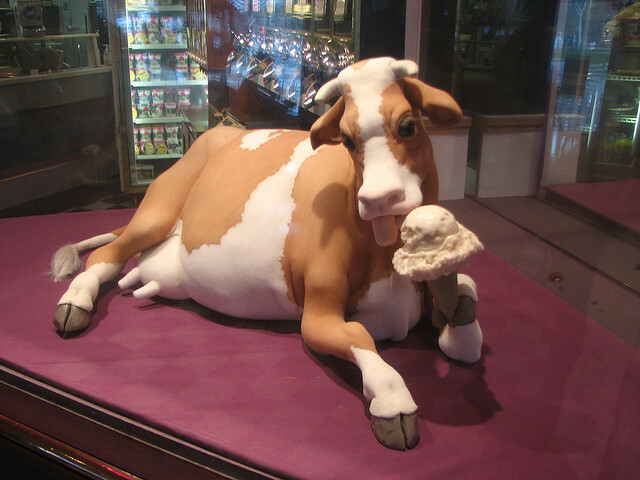 If you have an aversion to dairy but still want to make ice cream, go here!. Use the best ingredients available – you will notice the difference: Second-rate ingredients make for second-rate ice cream. Do experiment with your recipes – that is part of the fun! I believe the ice cream making legends Ben & Jerry have stated something along the line that even a “failed” ice cream usually tends to be quite OK (to eat) anyway – something that makes ice cream production even more gratifying. Just keep in mind that straying too far from the “classic proportions” of the various ingredients usually will have (negative) consequences for things like texture and consistency. Alcohol, while being a versatile and popular flavouring in its own right, also affects the freezing point. In other words, adding some alcohol will make your ice cream or sorbet freeze less firm, which can be a good thing. However, too much alcohol can seriously undermine the stability of your ice cream and leave you with a never-freezing slush! The relative low quantities of alcohol in ice cream recipes are there for a good reason – to make sure that your ice cream base mix eventually will freeze and stay in a comfortable frozen shape! Raw, un-pasteurised eggs can, if you are unlucky, bring about diseases. If using such eggs in your ice cream base mix, toddlers and pregnant women (and others worried about eventually being sick) should better avoid tasting your creation. You could also consider going for egg-less ice cream (American style, or others), or go for the Italian-French method (heating up your ice cream base mix, thereby pasteurising it yourself). The shorter time the final freezing of the base mix will take, the better. The longer the freezing takes, the larger the ice-crystals will grow … and the more icy (in a negative sense) your ice cream will be. Therefore, aim to prepare the base mix with as cold ingredients as possible – when making ice cream the American way (the cream-based Philadelphia method) the cream and the milk are likely to come straight out from the fridge anyway. But also remember to pre-cool the flavouring ingredients to be added (like cookie crumbles, fruit mixes, candy and the like). If you prepare ice cream the European (Italian-French) way (i e heating up the base mix before freezing it), really make sure that the resulting custard base is cold before trying to freeze it. Better yet, allow it to also mature overnight in the fridge, as this will improve the final texture of the ice cream considerably. Save for bananas, most fruits require various additional amounts of sugar to come across nicely in ice cream. Normal fruit juices might be used in sorbets but generally contain way too much water to work as a good main base for ice cream. Hygiene is essential! Keep things clean and do not give the pesky bacteria any chance to invade your ingredients. Good base-recipes will allow you to go a long way. Here, you will find four different ones (and one for sorbets) to begin with. Try them, compare them, and add flavouring and mix-ins as you like. Better understanding of the various ingredients in ice cream will open the door for further exciting experiments, for example playing around with different types of sugars and honey, or replacing milk and cream by soft cheese, or testing the effects of different stabilisers, or trying exotic or unusual mix-ins and flavours … making your own ice cream opens whole wide fields for experimentation!